West Coast Swing (WCS) is a form of swing dancing that originated from Lindy Hop, an American “street” dance born in New York City in the late 1920s. WCS developed during the late 1930s through early 1950s and, as its name implies, was the regional form of swing dancing in the West Coast of the US. Now, this genre has gained popularity internationally. WCS is the smoothest of the swing dance family. Its smooth and sometimes sensual qualities allow for a wide range of freedom of expression and lyricism. 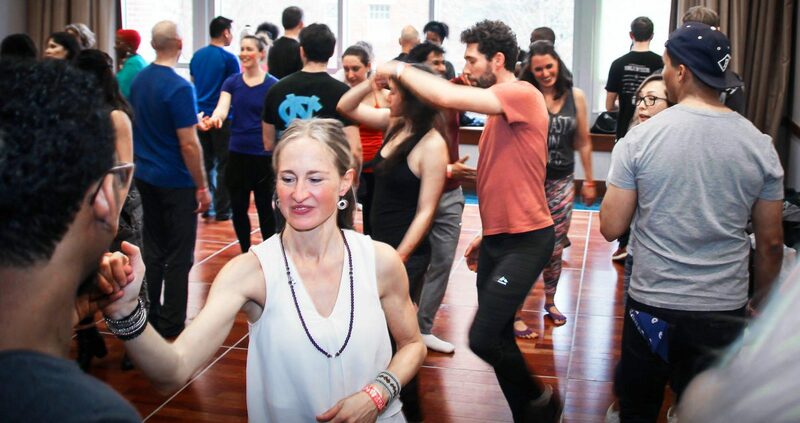 This allows partners to choose whether to have a fun and energetic or intimate style of dance. WCS is a lead-follow partner dance that emphasizes the conversation between the partners. The leader is responsible for selecting the patterns of the dance but is encouraged to create opportunities for the follower to shine within the dance. The follower is responsible for carrying out the intention of the leader but is encouraged to play and interpret within the leader’s overall structure. WCS is recognized as one of the most versatile and adaptable dance forms. Drawing influences from a variety of other dances, today, WCS can be found throughout the US and internationally. One of the best things about WCS is that can be danced to almost any music written in 4/4 time. In its present-day form, WCS is danced in the tempo range from about 80 to 160 beats per minute making it just about the most widely ranging partner dance in terms of tempo. It can also be danced to many genres of music including Swing, Blues, Rock & Roll, Pop, R&B, Cha-Cha and Contemporary to name a few.